I kinda like a boy and a girl likes to steal him alot so i need help please. How do i get him more interested in me? Don’t worry. It all because of your hormones. You’ll get over it. And try watching YouTube. And eat your favorite food. To cheer myself up I eat food and binge-watch YouTube. I totally get it. All I can say is that being a teenager stinks! Me too,I just can’t control it and I need to be alone when I’m like this because if people don’t leave me alone…. te won’t like what I will do next. Maybe try something new like going outside and show her you CAN be happy! i feel grumpy when i don’t get enough sleep or is that called cranky? I go on my tablet when I feel grumpy. Aw man. I am so sorry for you. I can relate and stinks. -think to yourself, are you upset and grumpy because of someone else. What may have happened to cause your day wrong? – Try and calm yourself down. 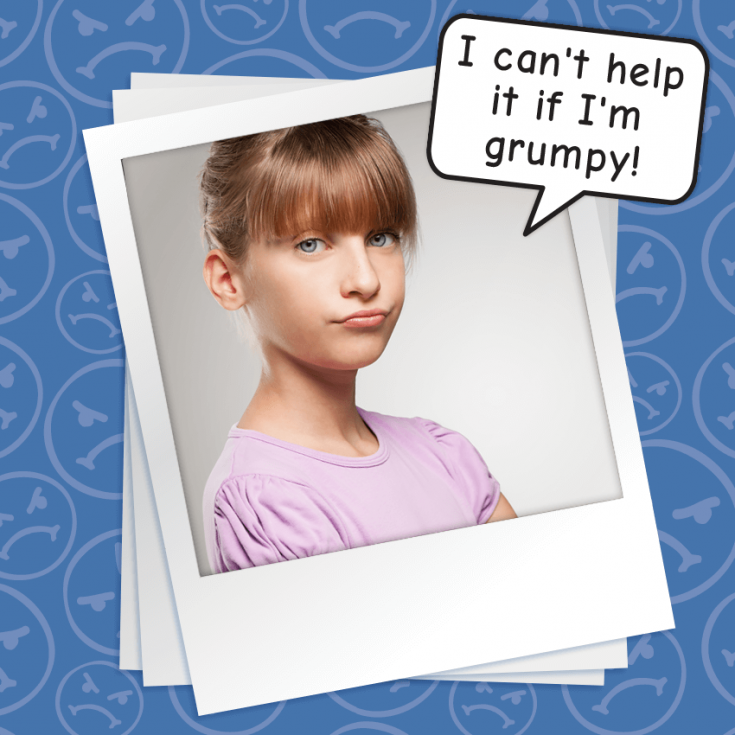 If you’re feeling grumpy, it is best to try and feel relaxed and clear your mind. That may sound like I’m a total freak but it works. If you have any complaints, then reply and if you have a question or need some advice, then reply to this for advice. Once again, I hope this is posted and have a good valentines day. Thank you, Book Reader. I realtor appreciate that. Thank you very much, Book Reader. I really appreciate it. If I feel grumpy I just go on my computer and watch videos. It may not be the same, but I can so relate. I’m always just in a serious mood and my mom’s like” You’re so serious.” whenever I don’t smile. There are times when I’m grumpy because if something is making me not happy, then I’m not happy at all. Unless if I think of good things, then I smile when I start thinking those good things. Try thinking of good things. This might not help, but did you know that it’s scientifically proven that if you smile you can trick your brain into thinking that your happy? Therefore, if you smile you might end up being happy on accident! I almost never smile, even if I’m in a good mood. I just have a natural poker face and my family picks on me for it. i hate too smile cuz i have braces 🙁 and HAPPY VALENTINES DAY!!!!!!!!!! Hey, I know how it feels to have braces. I didn’t like it at first, but now I’ve embraced it! And they won’t be there forever… You’ll have them taken off some day, and you’ll have beautiful straight teeth! You go girl! Your just going through puberty! Ikr!! Like even when I’m happy I have an attitude sometimes now!! I was going to say that when I saw this comment! Great minds think alike! Maybe that why am grumpy almost all the time. Hey,don’t worry about it. I’m a grumpy person too. Just start with meditation and relax yourself. It work most of the time for me. I get grumpy when my sister goes in my bed and wrecks it. Hi HorseCrazyGirl! I get grumpy and cranky when I feel lonely too! Hope I find a way to cheer myself up. Happy Valentine’s Day! I totally feel you! my friend actually lives in another city far from mine, and we communicate with email and snail mail. Also: You probably know this but I am homeschooled too! FINALLY ANOTHER HOMESCHOOLER SAID IT. This is off topic but I hate it when your parents tell you to have real friends and not follow random people on the internet….. but they homeschooled me, like how can they say that? My friend always tells me homeschooling is the worst.But I never know cause I never got homeschooled in my life.But maybe you should tell your mom to transfer you to a real public school. I talk to my BFF and together we sort things out whether it’s homework or crush problem.. Although sometimes I get a little grumpy too..
Ok so yesterday i heard this song and it’s not new or anything but it’s the first time I’ve ever heard it. It’s called No Filter by Britt Nicole. That song is amazing and has such a true, cryptic message. I can definitely relate. I am definitely guilty for wanting to cover up my flaws and putting my best self forward… we all can. The lyrics have really been jumping out at me and i mean at least in my opinion it makes me feel guilty… i mean this is a question you have to answer for yourself that only you can answer “how often do i use a “filter”? That message has really been on my mind for the last almost 24 hours. This is True and Real and inspires me to be the Real, Raw me. So, Going throughout next week that will be my anthem. I really want to apply that to my life. We are all human. We all make countless mistakes. For some of us We can get frustrated easily (which is very easy to do). For some it might be some deeper issues, but we are still fearfully and wonderfully made in God’s eyes. You know a key lyric line that really popped out to me was that “We hold it just for the moment”. We hold it for people to see, but our “Smile fades once the cameras off”. Sometimes “We do it all for show.” Idk how y’all relate to this but I definitely do. Alot of people are going through just like us and it’s our job to reach out to them and show love. I think a great way to start is to be completely honest. Ik sometimes it can be hard but we need to take off all of the excessive filters. And be who God has made us. So as i go through this new chapter of my life i hope this inspires you to do the same. “I CAN PICTURE US WITH NO FILTER ON”. #NOFILTER❤️ Have a great day!!! I hope you will join me!! Yes! You got this! I’m with you all the way!